As a minister, teaching and preaching occupies a lot of my time. How much time? I don’t know exactly. But a rough estimation would be that I spent around 100 hours last year either teaching or preaching. Almost every talk I give is unique; I almost never reuse my material. So in addition to that 100 hours, another 600 to 800 hours were spent preparing for teaching and preaching. So I spent 700-900 hours last year preparing to give a speech or actually giving a speech. Ministers probably spend more time giving and preparing to give public speeches than professional speakers do. Since it is an important element of my job, I know that I need to make sure I’m always trying to improve. So I try to read several books on preaching each year. Rarely, though, do I read a book that is about general public speaking rather than specifically preaching. But I stumbled across the blog of Scott Berkun, a professional speaker and writer, and I was impressed with what I read. So I ordered his book Confessions of a Public Speaker on my Kindle. I read it in a couple of sittings. Scott is an entertaining writer. And I learned much from the book, even if it is wasn’t written with ministers and preachers in mind. Confessions of a Public Speaker is Berkun’s advice on being a public speaker. It covers a wide range of topics, from preparation and pacing to overcoming the fears of public speaking and earning a living as a professional speaker. The book is very practical, though it’s not dry. He weaves his advice in with stories from his own experience. This makes for a quick and entertaining read. There wasn’t much about this book I didn’t like. I do wish that the book had been more comprehensive. Berkun’s advice was helpful, but it felt like an appetizer rather than the full meal. For example, he talks about creating tension in your talk and having a good rhythm in it. But he didn’t explain much about either of those two concepts. I was left wanting more. But, to be fair, Berkun didn’t intend his book to be comprehensive. It’s just that Berkun is such an insightful an entertaining writer about public speaking, I wanted more rather than less of the book. Would I Recommend It to Other Ministers? Yes. 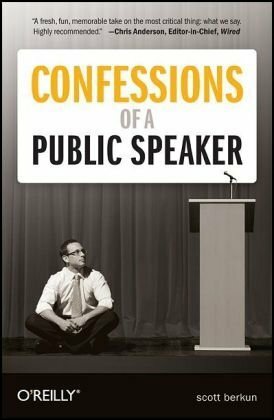 I would recommend it to people who want to be better public speakers. But be aware that you still need to read more comprehensive books. This alone won’t be very helpful to you, I think. And you probably won’t find any value in keeping it for a reference as you write talks. You’ll want other books for that. Still, it is an entertaining read, and most ministers and preachers would find something of value in it. If we just took to heart his encouragements to avoid wasting time on visuals when our thinking needs work, I think more sermons and lessons would be bearable. If we were do think clearly about our topics and practice our sermons and lessons, more people might actually look forward to our lessons and sermons. To be a great and famous public speaker perfect training is needed. People usually do not take this seriously. But I am agree with you that perfect training from some good professionals are needed.